1984 is the London play that just won't quit and is now at the Playhouse Theatre for a third West End run, this time with an entirely new cast. 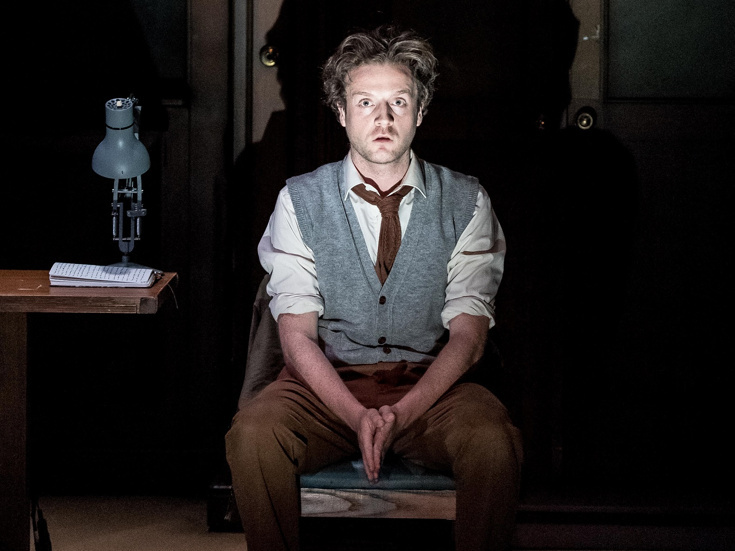 Adapted from George Orwell's chilling and prophetic 1949 novel, Robert Icke and Duncan Macmillan's stage version currently stars Liverpool-born actor Andrew Gower as Winston Smith, the Ministry of Truth employee who suffers a bleak trajectory as he learns to succumb to Big Brother. Broadway.com spoke to the lively West End newbie about chilling after an emotionally charged performance and facing down the novel's notorious Room 101—oh, and those rats. You're too young to have been around in 1984 itself. Hah! That's right, I was minus 4 then [Gower is now 27]: not even a twinkle in anyone's eye. Did you know much about the novel when this offer came your way? I hadn't read the novel, and when I then went to read it, I made a conscious decision not to actually finish it. I read up to a certain point—and the appendix—but I didn't actually read the final pages. That's interesting: why was that? I think I felt that I wanted to remain in a sort of Winston Smith head space so that I would know the story without having read the very end. In every other respect, and for every other big moment, the book has been like our bible, basically. I suppose it frees you up to form your own view of the character. Yes, and in fact at my first audition, [co-directors] Rob [Icke] and Duncan [Macmillan] were very interested to see how I would approach [the material] not having read the book. The fact is, there are so many people who have seen the film or read the book or both and they have such a concrete image of it all in advance, whereas I think it was important for me to go on a journey, discovering both the character and the book as I went along. The material is certainly timely. What's extraordinary is how genuinely timeless Orwell's writing is. So many current events or how they are reported in the press seem to fit what is described in the book, so you're always finding bits of the novel jumping out at you. Something will happen, and I will think, "that's very thought police, that's very double-think": it's as if Orwell has created a language to speak to us right now. Which must explain why a production first seen in London at the Almeida early in 2014 keeps coming back—and has toured internationally as well. From day one of rehearsals, every single member of the cast was basically referring to how poignant 1984 is for us today. There are so many reasons why [the production] has had a prolonged run, and I can't imagine why that shouldn't continue given the demand of people who either know the story already or want to discover it for themselves. I see him as a man who is forever trying to find an answer to his problem when there is never an answer but only further questions. The book doesn't give you answers and I don't think the play should either, beyond the fact that Winston starts the play not really knowing who he is and is constantly trying to find an identity and in a way only realizes by the end end how happy he has been. That awareness comes at a terrible price. Yes, Winston ultimately is a tortured soul trapped in a world in which he doesn't fit in. He's stripped back to a non-person, back to a blank canvas. There are so many images associated with the novel—not just the fearsome Room 101, but the rats that exist to torture Winston. It's funny you mention that because when I first told my parents I was doing this, my dad hadn't read the novel but my mum had and the very first thing she said was "rats!" She's English but lives in Turkey and is coming over this summer to see me in the play. So not one, then, for the squeamish. I wouldn't let [the rats] put you off a performance, but I suppose you can always stand up and leave [laughs]. You graduated from drama school [the Oxford School of Drama] six years ago but are only now making your West End debut. Yeah, which is funny because when I left drama school, I always envisaged that my career would be on stage; I never saw it going down the route of TV and film, so for this to be only my third theater job and in something so incredible and illustrious is really amazing. I saw you described in one of your TV roles as exhibiting a characteristic nervous energy in that part—is that how you see yourself as an actor? Well, it's always nice to hear what people pick up on, but for me it has to do with how you access emotions once you've found the character. On [BBC supernatural drama] Being Human, for instance, I might be playing a vampire but the job is still about presenting a character with whom the audience can form a connection—who feels real. To me, it's always about the search for identity. Is this show hard to switch off after each performance? At the moment, I've been stopping off at Whole Foods and buying myself a super green juice and watching highlights of the football on TV. Last night's performance, for instance, was quite raw and bloody so it took me a while. It's important to get back home and switch off and turn on some trashy television.